The KSR.info forum will be launched depending on our needs. You can also check the individual novels and stories pages and post your impressions and reviews. Do alternative history authors have a desire to change history? While every author places characters in motion, alternative history writers change events in a timeline. Does this come from a yearning to be a decision maker? From a drive beyond escapism to being a participant? A quilt for not fulfilling a lost chance? Let’s look at some possible scenarios. Born in 1947, Stephen King might have watched the TV in 1963 as Jack Ruby killed Oswald. Did the young King think of a cover up, a potential for a change that could have occurred if someone had stepped in to prevent JFK’s assassination? Was that the genesis of his alternative history novel 11/22/23? When Eric Flint wrote 1632, did the origin arrive from a desire to think of another chance for Germany other than the one chosen through our timeline? Did he foresee a different course had King Gustavus Adolphus of Sweden lived longer? Maybe the finances of that era posed other outcomes he saw. Did a different Germany aided by Sweden offer a stability not seen then? Alan Smale’s world of a Native American league standing up to ancient Rome played with two areas with the series Clash of Eagles. Could a Native league have formed? What if Rome survived into the 1200s? While Smale’s fascination may have come from his aerodynamic skills, he showed the Native strength coming from powerful Thunderbird gliders. But was Smale drawn into the concept of a Native league from discovering the history of Tecumseh’s dream of a Native union? Or the knowledge of the Iroquois Confederation? Was the novel a glimpse of Smale seeing decisions that could have led to another timeline? Do alternative history writers seek to change history? Correct a wrong? Most writers start with the “What if” of a character development or a question about a plot twist. Science fiction writers like to speculate about how an element of science affects people. But these examples don’t require the author to enter the fictional world as a player. Using existing timeline facts that lead to different decisions makes the writer a participant — does it not? Is there a way to do display comment showing most recent at top? Robinson likes EO Wilson's concept of confining humans to a portion of Earth's surface so other species have a better chance to survive. I wonder if he knows of Alan Savory's (controversial) work reclaiming land through cattle grazing management. I wonder what KSR thinks of it. Hi. I recently started reading New York 2140. While it is based on an interesting premise, I did find some of the language and the way God's name was used a couple times hurtful. I think the book could still convey the characters' passion and emotions without using God's name in that way. Whatta ya mean, non-series? If ever the ending of a book cried for another, that was it. Talk about a cliff hanger. Just 5-6 blank pages leaving me to ask WTH? Far too many possible directions that were triggered by the main characters (no spoilers from me :-) to leave it with a simple one liner. 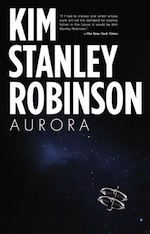 I am a french editor and I am looking Kim Stanley Robinson's literary agent. But I don't find him/her. If any one knows, could he contact me ? The book Green Earth is the first one I read by KSR and I love it. It is really great and I recommended it to some friends. Unfortunately, my friends understand only a little English and therefore I would like to ask if this book will be translated into German. If yes, I could present it to my friends. I would like to ask when and if "2312" will be released in Italy market. I just finished reading the Red Mars chapter “Homesick”. It is a powerful state of mind that I’m left with. An incredible rush of new insight leading to nothing short of the peace and tranquility of love. But then I’m just an old hippie with unfinished dreams. Thank you Kim Robinson. I love The Martians and whole Mars trilogy. I wonder if there's any chance yours books get a portuguese edition? I'm catching up on KSR's work- my last read was Rice and Salt- so I slogged through Shaman. Well worth the effort but a bit too long. One question for whoever reads this: "mamma mia"? KSR speaking in Cali this May? Hi all - does anyone know of any speaking engagements by KSR anywhere in California between May 12th and 27th this year? I'm in the area, I've never had the chance to see him talk live, and I'm holding out hope that he might have something on. I knew since I read the Mars series (and gave up on the last book) that Kim has an excellent knowledge of science and its possibilities, but that his knowledge of politics and finance is strictly lower class. 2312 was an excellent book, full on interesting ideas on the future of our solar system and the transforming of celestial bodies and the creation of new ones. It was a really interesting idea. The novel kept one moving and anxious to continue to read. 2. The issue with this is first, Kim is part of the 1%. Of 7 billion people on earth, the 1% comprises anyone with an income of $400,000/per year and/or a new worth of around $800,000. 3. That is a lot of people, (70M) including him and me. 4. Kim seems to forget that without unbridled capitalism we would all still be living in caves and gathering roots and berries. Is that what he wants? Kim would condemn our ancestor who picked up a stick, hooked it to a horse and displaces four guys with sticks. That is productivity and it is the only reason we are not still living in caves and gathering roots and berries. Bottom line: Great scientific ideas. Poor understanding of capitalism and how it has created the “wealth of nations.” Suggestion: Stay with the kind of novel like 2312. That way, he will not demonstrate his poor understanding of the modern world of finance. From Slate "Space isn't a void"
Mostly agree with this. But I think it misses the historical evidence that frontiers spur innovation, and the best of that innovation flows back to improve lives in the home country which is sending people to the frontier. Definitely we need sustainability in our biosphere, and space dev is very costly and risky compared to similar efforts on Earth. But look at the USA frontier's effect on Europe - monarchies over, all the cars, skyscrapers and modern tech, the internet. This is a simplistic example, but I'm sure a strong case could be made for frontiers sending back innovations which improve lives in the origin culture. I know nothing of the man. I had never heard of Kim Robinson. I was sitting in a coffee shop in a B&N while my wife shopped. I read, but I was not in the mood to book hunt. I love science fiction books, fantasy, and classics. This f*cking book kept catching my eye for some reason. I looked at it about ten times. I could not figure out why and walked to it, picked it up, and began reading it. It was 2312. My wife came over and said, "Funny, the title of this book is the same as our address." Boom. Mind blown. I bought it immediately. I still have not read it, but it sits on my bookshelf because I live there! I kust now heard only 5 minutes of an interview with Mr Robinson where he spoke of the fundamnetal issue of law reform. I am not familiar with his work but learned within that 5 minutes that he is visionary and clearly grounded in his analysis. I teach a course at a law school where I address the necessity of altering our concepts of what is "property", property law and use, and the extention of natural "personhood" to ecosystems and wildlife (to protect them under law). I would like two things - 1) recommendations for me on his essays, etc., and 2) to contact him for possible contribution to my law course. I love your writing! I just finished Aurora, Shaman and New York 2140. (Reverse order of reading). I am in awe of your writing. Did I say I love your writing? I wish I could articulate my thoughts to you about your characters, stories, research, science and most of all connections to nature. You are brilliant! I am telling everyone to read your books and will be gifting several. Thanks for your amazing stories. Since the quantum computer is smart enough to narrate the story, it is probably smart enough to raise children. It would be advantageous to just freeze sperm and eggs and then combine them when reaching Tau Ceti instead of having people trapped in a ship for that long. The rest of the life support could be frozen, or could just be allowed to live for the duration of the trip. I am totally gobsmacked after finishing KSR's "Red Mars". The detail and world building, the character building and the explanations about the (not geology) aerology and everything else in this book totally amazes me. KSR's attention to detail is the best. If he is like this in real life, he is probably hard with which to live. Amazing author, amazing story. I look forward to "Green Mars" (when I can afford it in an e-book format). Thank you so very much, KSR. Wonderful! I am a space enthusiast. recently I was in a conference from AIAA (53 confreence Atlanta 10-12 July). in that conference, in some speech some one talk above the possibility to using the sand of Phobos and Deimos for aerobraking on Mars. On page 378, "a) the citizen" gives an inspiring overview of the non-carbon-based energy technologies, some already in existence, some imagined. I think this would be a wonderful excerpt to put online and spread it everywhere.I wonder if Mr. Robinson would think this a good idea? Just a thought, I'm not doing it!!! About two character names in "Blue Mars"
Currently I am enjoying reading "Blue Mars" in Japanese. Now I saw two characters' name which is Priska and Irishika. I am wondering if these two names show the different person. I think they are Swiss persons who is familiar with law and consitition. Does anyone know of a list of the unique vocabulary words that KSR has invented & used in NY 20140? (e.g., bacino, graphene, skyvillage) I'd love to have a list of those words with definitions. It would help me understand a little better what I am reading. Octaviasdottier in NY2140 is homage to Octavia Butler? http://northwardho.blogspot.tw/2017/03/the-character-in-ksr-novel-ny2140.html -- Octaviasdottier in NY2140 is homage to Octavia Butler? Ref. to "What will it take for us to colonize the MilkyWay? Humans need not migrate themselves to colonize the Milky Way. The could migrate life, in the fom of microbes, engineered to survive in an environment. What if we could place microbes on Venus that can survive its temperature, and reproduce ? And then let nature take over, and evolve these bacteria into something more complex, perhaps altering the atmosphere and creating animal life in the process ? Im not saying that "building" such microbes will be easy, but I certainly believe it to be easier and more feasible than moving ourselves into the universe using spaceship arcs. I think microbes is the correct way to continue. The reason it is not popular, is because it will take about one billion years for the Venus microbe to evolve into intelligent life, and that is the best case scenario. And none of us is ready to wait that long! So perhaps it is our vanity that prohibits us from colonizing space ? We want immediate results so that the people involved in the program get the credit while they are alive. I do not think that interstellar travel will work at such small scales. Thank you for your time to read this, I would be interested in a response at dim DOT tripakis At gmail dot com. Aurora (German ed.) contains many "interesting words" like "Wahrscheinlichkeitsblindheit" (e: blindness for probability?) or "Ankerheuristik" (e: anchoring heuristic) which I searched for. The combination of both (in german) yields in just 1 (!) hit: Dean Buonomano: Brain Bugs. I assume, Kim read it? Fantastic interview in High Country News! As a fellow resident of Davis who has worked for decades to protect the Sierra Nevada, thank you. My name is Patrick Haney, and I want to send a letter to Kim Stanley Robinson for a school English project about his short story "the Lucky Strike". Does anyone have his contact information (even email), or is there anyway I can get to it? If you've already seen this comment, sorry about that: it didn't show up so I wrote a new one. My name is Patrick Haney, and I want to send a letter to Kim Stanley Robinson for a school English project about his short story "the Lucky Strike". Does anyone have his contact information (even email), or is there anyway I can get to it? I wonder what KSR thinks about these private corporations readying to go into space (like Elon Musk's Space X, etc.). Sorry, I haven't had time to read all the comments to see if this has already been discussed. My qualm is, will there be any utopians on board as in the Mars Trilogy? I somwhow doubt it! Brilliant as usual, but possibly overly pessimistic? Human interstellar travel seems highly unlikely given our self destructive instincts but a world ship is not technically impossible as KSR shows us. The idea that alien worlds with life would kill life from elsewhere is interesting. I think it's more likely that since evolution would have proceeded separately we wouldn't make a good host for alien prion like diseases or other single celled organisms and viruses. Getting to a habitable planet will be the hard part. Unlikely as it seems since we haven't even managed to get back to the moon in the last 40 years I think humans will eventually achieve the goal if we get through the next 100 years or so. just by chance -- a new book on the future of New York City comes out just before Kim's in October, 2016, called Ecotopia 2121. It's filled with 100 full-color pics of what 100 Green cities of the future will possibly look like (if they survive the eco-catastrophes of today and go on to become super ecofriendly, that is). On pp. 282-283 of Red Mars, the author has character John Boone drive a rover from Bradbury Point to Acheron, some 5000 kilometers to the west. From the map of Mars at the front of the novel, we see that Acheron is at the far left, and Bradbury point is well right of center. But since the map shows the entire planet -- i.e., all 360 degrees of Mars -- that would mean it would actually be a shorter distance to drive if Boone went east to Acheron rather than west. Can anyone explain this apparent discrepancy? Kim Stanley Robinson will be giving the keynote lecture at the April 15th event sponsored by Columbia's Temple Hoyne Buell Center for the Study of American Architecture. More information can be found here and here. Free and open to the public. We hope you can make it! "Power and the Space of the Planet"
Hi! I think it is necessary to add in the chapter about translations a new information that the novel "2312" is published in Russia. I bought this book in the shop yesterday and was reading it half a night with a great pleasure. It was really hard to stop and go to sleep :-) Big thanks to the author! They have not given enough thought to their position. Or, if I am not allowed that – then allow me this – any action towards Mars “changes it” including looking at it. So, if the Reds are so damned hell bent on leaving Mars in its pristine state, they not only should they not set one single foot or pod or wheel on it, but should not enter its orbit and should not even look at it from afar. You cannot be “partially” pregnant. You are either “changing Mars” or you are not. It is like the joke: A guy meets a woman in a bar and says, will you sleep with me if I pay you 1 million dollars, she says yes; then he says, how about if I pay you $10 – and she says, what do you think I am a prostitute, to which he replies, we have already established that, we are now only haggling over the price of the service. Changing Mars is changing Mars. I am very terrible about remembering titles but get a feel for authors. There was a story i read that was an extremely slow downfall of "the grid". Two children that had educated parents that had moved them into the country because of what they believed to be danger in the cities oncoming. Together they learned gardening and other obvious self sufficientcy living. What struck me about this story was how in the first part of the book, the young girl character said something to effect of no-one noticed the fall because it happend so slowly. Everyone just got used to the power going out every once in a while. But slowly it increased until there was no "grid" ETC. anyone have a clue? Je dois dire que j'ai eu du mal, mais terminer la Trilogie Martienne m'a vraiment fait beaucoup de bien. Une petite pause en passant par d'autres auteurs, mais vivement "Les Martiens", "Chroniques des Années Noires", et, malheureusement, bien d'autres sont très mal distribués en Belgique. Malgré un style parfois soporifique, la richesse de contenu submerge le lecteur féru de sciences humaines, de géographie, de physique, d'astronomie, de génétique, ou encore de biologie. Impossible bien sûr de tout retenir, de tout assimiler... Et on ne résume pas 15 ans de travail en 2000 pages. Watching Bill Moyers talk with Jim Hightower, Hightower while discussing the revolution, so to speak, gets into the co-op movement a bit, talking about how widespread and under-reported the movement is. I just re-read Antarctica a week or so ago, and KSR also went into some detail about how that movement is growing. Other than food co-ops, which I've belonged to for decades, and credit unions (ditto), I'm hard-pressed to find other co-ops. Would love to find a health plan co-op, for example. I've done a little searching for a co-op directory of some sort but with very little luck. Anyone know of such a thing? Really struggling with Galileo's Dream. Like the premise and the plot but the "hard science" is way overdone and boring and detracting from the story. Either Galileo is sour and a grouch or immersed in stuff I just do not understand to that depth. Would love to finish but have put it down for now. I read a lot of sci-fi, but this one is out of balance if you ask me. I am really struggling with Galileo's Dream. I like the premise and plot ideas, but the "hard science" is way overdone , boring and detracts from the story in my judgment. Galileo is either grouchy and sour or immersed too deep in temporal physics I do not understand and cannot relate to the overall story. Ilike science fiction and read a lot, but I have put this one down halfway through. Too much other stuff to read that I will like better. I've never read a quartet (including The Martians) twice with the possible exception of The Foundation Series but I'm too old to remember. I just wanted to thank Dr. Kim for his work. I'm now back to Red Mars for the third time in a year. It's the next best thing to being there.